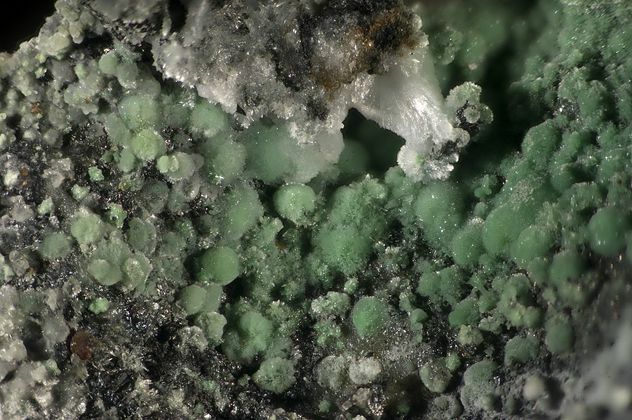 Morenosite: Mineral information, data and localities. Apple green or greenish white; green in transmitted light. Named after Señor Antonio Moreno Ruiz (1796-1852), Spanish pharmacist and chemist, Academy of Natural Sciences, Madrid, Spain. A complete series exists to Epsomite. Artificial crystals are short prismatic . Occurs naturally as efflorescent crusts of indistinct crystals and fibers; stalactitic. Magnesian Morenosite A magnesium-bearing variety of morenosite, containing Mg in substitution for Ni up to the 1:1 ratio with Mg, after which the material in the series is epsomite (50% rule). Retgersite 6 photos of Morenosite associated with Retgersite on mindat.org. Pennine 3 photos of Morenosite associated with Pennine on mindat.org. Pentlandite 2 photos of Morenosite associated with Pentlandite on mindat.org. Pyrrhotite 2 photos of Morenosite associated with Pyrrhotite on mindat.org. Siderite 2 photos of Morenosite associated with Siderite on mindat.org. Nickelhexahydrite 1 photo of Morenosite associated with Nickelhexahydrite on mindat.org. 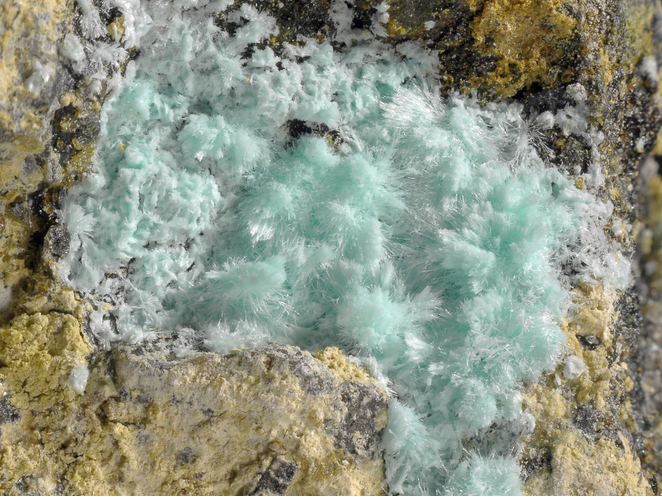 Aragonite 1 photo of Morenosite associated with Aragonite on mindat.org. 25.12.13 Nickelhexahydrite (Ni,Mg,Fe)SO4 · 6H2O Mon. Cronstedt A. (1758) Mineralogie; eller Mineral-Rikets Upstallning. 12mo, Stockholm: 114 (as Nickel-Viktril & Vitriolum ferrum et nicolum continens). Hunt in: Dana, J.D. (1850) System of Mineralogy, 3rd. Edition, New York: 679.
von Kobell (1852) Gel. Anz. Akademie der Wissenschaften, Munich: 35: 215 (as Pyromelin). von Kobell (1853) Journal für praktische Chemie, Leipzig: 58: 44 (as Pyromelin). Marignac (1855) Arch. sc. phys. nat. Genève: : 14: 238. Fulda (1864) Ann. Chem. Pharm. : 131: 213. Topsøe and Christiansen (1874) Annalen der Physik, Ergzbd. : 6: 549. Dufet (1878) Bulletin de la Société française de Minéralogie: 1: 58. Wyrouboff (1880) Bulletin de la Société française de Minéralogie: 3: 73. Blasius (1885) Zeitschrift für Kristallographie, Mineralogie und Petrographie, Leipzig: 10: 238. Pisani (1892) Bulletin de la Société française de Minéralogie: 15: 48. Laspeyres (1893) Verh. nat. Verein, Bonn: 143: 375. Retgers (1895) Zeitschrift für Physikalische Chemie, Leipzig, Berlin: 16: 577. Gossner (1907) Berichte: 40: 2374. Goldschmidt, V. (1920) Atlas der Krystallformen. 9 volumes, atlas, and text: vol. 6: 63. Ulrich (1921) Casopis Mus. Cesk. : 95: 123. Longchambon (1922) Bulletin de la Société française de Minéralogie: 45: 239. Beevers and Schwartz (1935) Zeitschrift für Kristallographie, Mineralogie und Petrographie, Leipzig: 91: 157. Cavinato (1937) Reale accademia nazionale dei Lincei, Rome, Att. : : 25: 399. Cavinato (1938) Periodico de Mineralogia-Roma: 9: 141. Hutton (1947) American Mineralogist: 32: 553. Casares (1949) (see Alcibar in Rivista di mineralogia e cristallografia italiana, Padua: 305 )(as Sulfato de niquel). Frondel, C. and Palache, C. (1949) American Mineralogist: 34: 188. Casares (1851) Rivista di mineralogia e cristallografia italiana, Padua: 176 (as Sulfato de nickel & Morenosita). Palache, Charles, Harry Berman & Clifford Frondel (1951) The System of Mineralogy of James Dwight Dana and Edward Salisbury Dana Yale University 1837-1892, Seventh edition, Volume II: 516-519. Ptasiewicz-Bak, H., I. Olovsson, and G.J. McIntyre (1997) Charge density in orthorhombic NiSO4·7H2O at room temperature and 25K: Acta Crystallographica: 53: 325-336. Xinxin Zhuang, Genbo Su, Guofu Wang, Guohui Li, and Zixiang Huang (2004): Structure, growth and optical properties of Zn0.24Ni0.76(SO4).7H2O single crystal. Crystal Research and Technology 39, 754-758. Zeitschrift für Kristallographie: 91: 157-169. Dana 6: 940; Palache, C., Berman, H., & Frondel, C. (1951), The System of Mineralogy of James Dwight Dana and Edward Salisbury Dana, Yale University 1837-1892, Volume II: 518. Lapis, 24, 7/8 (1999); J. Gröbner und U. Kolitsch (2002): Neufunde von Laurion aus den Jahren 2001 und 2002. Aufschluss 53 (5-6), 363-371. Boscardin, M., Colmelet, G. (1977) Morenosite della Val d'Ayas (Aosta). Rivista Mineralogica Italiana, 1 , 2, 31-32; Piccoli, G.C., Maletto, G., Bosio, P., Lombardo, B. (2007) Minerali del Piemonte e della Valle d'Aosta. Associazione Amici del Museo "F. Eusebio" di Alba, Ed., Alba, 607 pp. Del Caldo, A., Moro, C., Gramaccioli, C.M., Boscardin, M. (1973): Guida ai minerali. Fratelli Fabbri Editori, Milano, 208 pp. ; Castello, P. (1974): Il giacimento di amianto di Emarèse. Bull. Soc. Flore Valdôtaine, 28, 63-67; Castello, P. (1981): Il giacimento di amianto di Emarèse (AO). Riv. Mineral. Ital., 5, 3 (3-1981), 86-90. Del Caldo, A., Moro, C., Gramaccioli, C.M., Boscardin, M. (1973): Guida ai minerali. Fratelli Fabbri Editori, Milano, 208 pp. ; Castello, P. (1974): Il giacimento di amianto di Emarèse. Bull. Soc. Flore Valdôtaine, 28, 63-67; Gramaccioli, C.M. (1975): Minerali alpini e prealpini. Istituto Italiano Edizioni Atlas, Bergamo, 2 vol., 472 pp. ; Castello, P. (1981): Il giacimento di amianto di Emarèse (AO). Riv. Mineral. Ital., 5, 3 (3-1981), 86-90. Palache, C., Berman, H., & Frondel, C. (1951), The System of Mineralogy of James Dwight Dana and Edward Salisbury Dana, Yale University 1837-1892, Volume II: 498, 518. Palache, C., Berman, H., & Frondel, C. (1951), The System of Mineralogy of James Dwight Dana and Edward Salisbury Dana, Yale University 1837-1892, Volume II: 518; Mineralogical Magazine (1964): 33: 1110; Duda, Rejl, Slivka: "Mineralien", 1991; Martínez Alcíbar, A. (1850) Raro e importante mineral de níquel. Revista Minera, 1, 302-306. Anthony, J.W., et al (1995), Mineralogy of Arizona, 3rd.ed. : 306; Galbraith, F.W. & Brennan (1959), Minerals of AZ: 61. Pemberton, H. Earl (1983), Minerals of California; Van Nostrand Reinholt Press: 263, 270, 273. USGS (2005), Mineral Resources Data System (MRDS): U.S. Geological Survey, Reston, Virginia, loc. file ID #10033778. Morton, P.K. (1977) Mines and mineral resources of Imperial County, California. California Division of Mines and Geology County Report 7, 104 pp. : 79-80; Pemberton, H. Earl (1983), Minerals of California; Van Nostrand Reinholt Press: 270. Dana, E.S. (1892) System of Mineralogy, 6th. Edition, New York: 1096; Becker, George F. (1888b), Geology of the quicksilver deposits of the Pacific slope: USGS Monograph 13, atlas: 389; Murdoch, Joseph & Robert W. Webb (1966), Minerals of California, Centennial Volume (1866-1966): California Division Mines & Geology Bulletin 189: 274; Palache, C., Berman, H., & Frondel, C. (1951), The System of Mineralogy of James Dwight Dana and Edward Salisbury Dana, Yale University 1837-1892, Volume II: 518. Palache, C., Berman, H., & Frondel, C. (1951), The System of Mineralogy of James Dwight Dana and Edward Salisbury Dana, Yale University 1837-1892, Volume II: 518; O'Donoghue, 1978 - "Encyclopedia of Minerals & Gemstones", p283. Rocks & Minerals 82:402-407; Hudson, Frank Samuel (1922), Geology of the Cuyamaca region of California with special reference to the origin of the Nickeliferous pyrrhotite: University of California, Department of Geological Sciences Bulletin: 13: 214, 217; Pemberton, H. Earl (1983), Minerals of California; Van Nostrand Reinholt Press: 270, 321. Woodhouse, C.D. & R.M. Norris (1957a), A new occurrence of millerite American Mineralogist: 42: 113-115; Davis, Fenelon Francis and E.H. Bailey (1966) Mercury. California Division Mines and Geology Bulletin 191: 267, 270. Stinson, Melvin Clarence (1957a), Geology of the Island Mountain copper mine, Trinity County, California: California Journal of Mines and Geology: 53: 25; Murdoch, Joseph & Robert W. Webb (1966), Minerals of California, Centennial Volume (1866-1966): California Division Mines & Geology Bulletin 189: 274; Pemberton, H. Earl (1983), Minerals of California; Van Nostrand Reinholt Press: 270. Min.Rec. :21:103; Dana 6:1069; Dana 7:I:235,241; Palache, C., Berman, H., & Frondel, C. (1951), The System of Mineralogy of James Dwight Dana and Edward Salisbury Dana, Yale University 1837-1892, Volume II: 490, 518. R. C. Smith II, The Mineralogy of Pennsylvania 1966-1975, Special Publication No. 1, Friends of Mineralogy Pennsylvania Chapter, 1978.